The main focus of this volume is on the problem of describing the automorphism groups of affine and projective varieties, a classical subject in algebraic geometry where, in both cases, the automorphism group is often infinite dimensional. The collection covers a wide range of topics and is intended for researchers in the fields of classical algebraic geometry and birational geometry (Cremona groups) as well as affine geometry with an emphasis on algebraic group actions and automorphism groups. It presents original research and surveys and provides a valuable overview of the current state of the art in these topics. 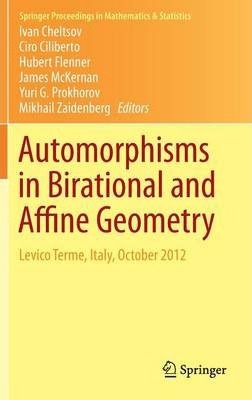 Bringing together specialists from projective, birational algebraic geometry and affine and complex algebraic geometry, including Mori theory and algebraic group actions, this book is the result of ensuing talks and discussions from the conference "Groups of Automorphisms in Birational and Affine Geometry" held in October 2012, at the CIRM, Levico Terme, Italy. The talks at the conference highlighted the close connections between the above-mentioned areas and promoted the exchange of knowledge and methods from adjacent fields. Illustrations note 21 Illustrations, black and white; IX, 518 p. 21 illus. Preface.- Part I Birational automorphisms.- H. Ahmadinezhad: Singular del Pezzo fibrations and birational rigidity.- I. Arzhantsev, A. Popovskiy: Additive actions on projective hypersurfaces.- J. Blanc, F. Mangolte: Cremona groups of real surfaces.- M. Brion: On automorphisms and endomorphisms of projective varieties.- I. Cheltsov: Del Pezzo surfaces and local inequalities.- T. de Fernex: Fano hypersurfaces and their birational geometry.- T. Eckl, A. Pukhlikov: On the locus of non-rigid hypersurfaces.- S. Lamy: On the genus of birational maps between 3-folds.- A. Massarenti, M. Mella: On the automorphisms of moduli spaces of curves.- P. Mondal: Normal analytic compacti fications of C^2.- V. L. Popov: Jordan groups and automorphism groups of algebraic varieties.- Yu. Prokhorov: 2-elementary subgroups of the space Cremona group.- D.-Q. Zhang: Birational automorphism groups of projective varieties of Picard number two.- Part II Automorphisms of a fine varieties.- A. Assi: Rational curves with one place at in finity.- A. Belov, L. Bokut, L. Rowen, Y. Jietai: The Jacobian Conjecture, together with Specht and Burnside-type problems.- A. Dubouloz, D. R. Finston, I. Jaradat: Equivariant triviality of quasi-monomial triangular G_a-actions on A^4.- A. Dubouloz, L. Moser-Jauslin, P.-M. Poloni: Automorphism groups of certain rational hypersurfaces in complex four-space.- G. Freudenburg: Laurent cancellation for rings of transcendence degree one over a field.- R. V. Gurjar, K. Masuda, M. Miyanishi: Deformations of A^1- fibrations.- T. Kishimoto: Remark on deformations of a fine surfaces with A1- fibrations.- S. Kuroda: How to prove the wildness of polynomial automorphisms, an example.- F. Kutzschebauch: Flexibility properties in complex analysis and a fine algebraic geometry.- A. Lewis: Strongly residual coordinates over C_[x].- V. Lin, M. Zaidenberg: Con figuration spaces of the a fine line and their automorphism groups.- L. Makar-Limanov: On the Newton polygon of a Jacobian mate.- S. Maubach, R. Willems: Keller maps of low degree over finite fields.- P. Russell: Cancellation.